Background Diesel exhaust contains large numbers of ultrafine particles (UFPs, <0.1 µm) and is a recognized human carcinogen. However, epidemiological studies have yet to evaluate the relationship between UFPs and cancer incidence. Methods We conducted a case-control study of UFPs and incident prostate cancer in Montreal, Canada. Cases were identified from all main Francophone hospitals in the Montreal area between 2005 and 2009. Population controls were identified from provincial electoral lists of French Montreal residents and frequency-matched to cases using 5-year age groups. UFP exposures were estimated using a land use regression model. Exposures were assigned to residential locations at the time of diagnosis/recruitment as well as approximately 10-years earlier to consider potential latency between exposure and disease onset. Odds ratios (OR) and 95% confidence intervals (95% CI) were calculated per interquartile range (IQR) increase in UFPs (approximately 4000 particles/cm3) using logistic regression models adjusting for individual-level and ecological covariates. 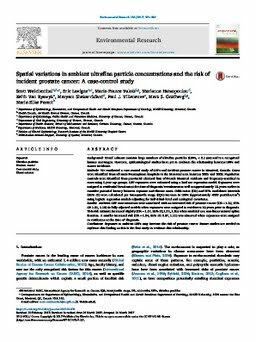 Results Ambient UFP concentrations were associated with an increased risk of prostate cancer (OR=1.10, 95% CI: 1.01, 1.19) in fully adjusted models when exposures were assigned to residences 10-years prior to diagnosis. This risk estimate increased slightly (OR=1.17, 95% CI; 1.01, 1.35) when modeled as a non-linear natural spline function. A smaller increased risk (OR=1.04, 95% CI: 0.97, 1.11) was observed when exposures were assigned to residences at the time of diagnosis. Conclusions Exposure to ambient UFPs may increase the risk of prostate cancer. Future studies are needed to replicate this finding as this is the first study to evaluate this relationship.